I really cannot recommend the series C & S Walk, Knaphill enough. Perhaps it is because as we complete a segment it has always been a glorious spring-like day; cold but with a beautiful blue sky. Perhaps it is because the route takes us through lovely Surrey countryside, ambling down footpaths we’ve never trodden before, or because each cache is a little bit different than the last. Last Sunday’s expedition drew us near to our 200 finds mark but Monday we were back on the trail again and passed 200 with flying colours. Before we started our caching route we had to cross the main Guildford Road (A322). A very busy road so being good, we walked up to the pedestrian traffic lights, pressed the button and waited for the light to turn green. Half-way across I did a double-take and managed a quick iPhone photo as I have never seen a traffic light with a horse before. 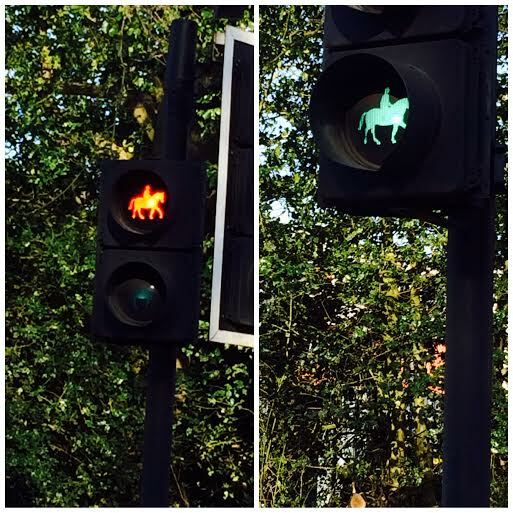 Once we had crossed I turned around and saw that the red one had a horse and rider too! I dread to think what the drivers of the cars were thinking; this mad woman stopping in the middle of the road to take a picture of the lights! Another thing, if the lights are for horse and riders, the button is far too low to reach from horseback. Not well thought out at all. We managed to find 10 caches on a sort-of circular route starting with In a Massive Sandwich and travelling anti-clockwise to Really Branching Out. The cache owners (a father and son) go to great lengths to make each cache a bit different. They screw hooks inside of trees – high up so you have to feel for them. They favour oak trees probably because of their enormous size and the great oaks often have plenty of cracks and crevices ideal for hiding a cache. 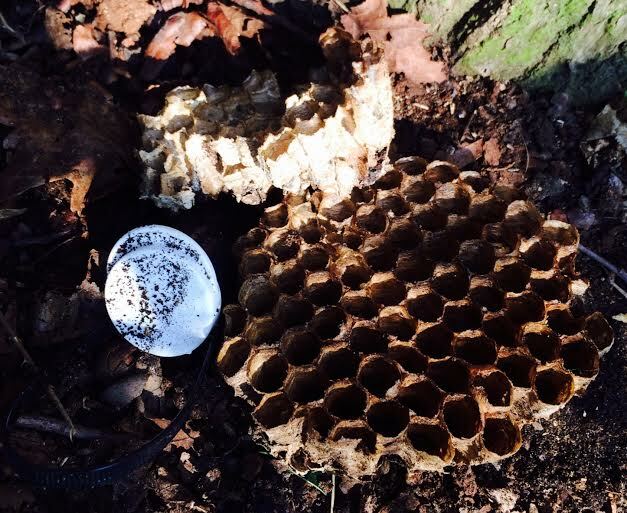 One of the caches on the circuit was hidden in a huge crevice at the back of a gigantic oak tree and the hole had been almost filled with huge chunks of honeycomb. The cells of the honeycomb were much bigger than those of the normal honey bee so I am not sure who or what made the honeycomb but I am extremely glad that it was winter and not summer when the insects would be flying! The white lid in the picture is the top of a usual film cannister which will give an idea of the size of the cells. Our walk took us around parts of Chobham Golf Club and once we had found the cache at White Post, we back-tracked just a few yards to sit on the seat conveniently situated facing one of the greens. No-one was playing so we enjoyed a lovely rest in the reasonably warm February sunshine. Three more caches and then we were nearly back at the car. We have found that Mondays are not good days for finding somewhere to have a late lunch so we drove a short way to a garden centre I knew well. Wish we hadn’t bothered. As we arrived the unsmiling waitress told us that they had just stopped serving meals so we could either have afternoon tea or a choice of cake. Cockrobbinn chose a piece of Lemon Drizzle Cake which was plomped down on the table with quite a force and no fork or napkin !! I did smile to myself though as we left and noticed that Cockrobbinn’s walking books had deposited a huge pile of mud underneath the table and a trail to and from the cutlery/napkin shelf!! We are now well-over halfway through the series of C & S Walk but we are going to have to revisit one of the sites although we still cannot make up our minds whether we just didn’t look properly (most likely) or whether the cache is actually void. The name of the cache is, wait for it…………Void. When we couldn’t find the container, we took the easy way out by saying that perhaps it had been renamed Void because it wasn’t there any longer but looking at the description when we got home, it doesn’t mention being archived and it was also found twice in January. Methinks more looking is needed ! As of today, 11th February, we have an amazing 211 finds to our name. I did creep out this morning and surprisingly quickly found six very local caches; all on army ground (we have a lot of that around Camberley). 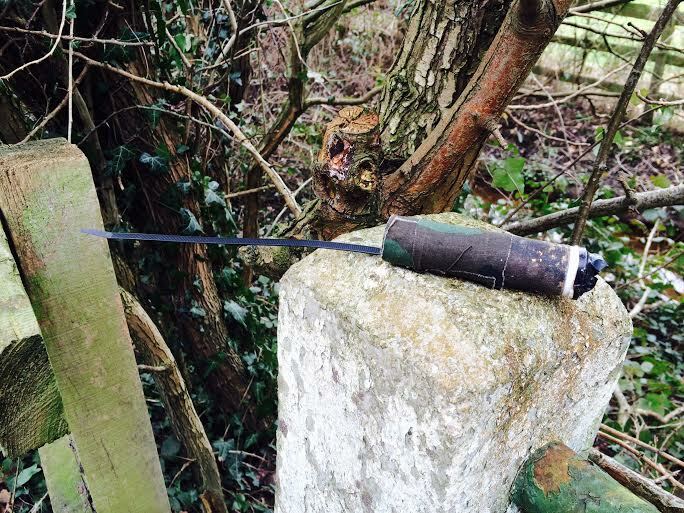 Every time I see a sign saying ‘Do not touch suspicious objects’ I wonder whether the M o D have ever seen some of our more interesting caches ! I am excitedly preparing for my trip to Kentucky but not quite so pleased to hear that -16° has been forecast; must find the thermals! This entry was posted in Caching, Camberley, Geocaching, iPhone, Knaphill and tagged Bod Charger, Cache, Camberley, Geocaching, Knaphill, Traffic Lights. Bookmark the permalink. 6 Responses to Our 200th Find Reached and Passed !! We’ve stalled at just under 300. I’m still out and about as much but the numbers are certainly slowly. We’re on a roll at the moment as everything seems new: blog, Twitter etc. It will probably slow down if we get a good summer as we are lazy beach bums if the sun is out! This sounds like a good series – we’ll add it to our to-do list! Congratulations on your milestone. We have a big one coming up soon and I am desperately trying to think of a good cache to tackle for it. You must definitely think of something special to celebrate your 1000th!